As we salute our veterans, an urgent plea for help in the Philippines. The Philippine Red Cross has "deployed assessment, rescue and relief teams to evaluate the damage and to support rescue efforts." CARE says, "Our current focus is on providing the immediate essentials – shelter, water and food – to communities hit hardest by this disaster. International support will be essential to preventing further loss of life and helping families begin to rebuild their lives over the coming weeks and months." World Food Program has "mobilized an immediate $2 million for the response, but will be appealing for more funds as the needs become clearer. As a preliminary measure, 40 metric tons of fortified biscuits are due to be flown in from Dubai in the coming days. High Energy Biscuits are often provided in the early days of a crisis as they are light to transport and do not need cooking. WFP is also looking at a range of other food commodities to stabilize the nutrition situation and meet immediate food needs." AmeriCares: "Even before the monstrous typhoon struck, AmeriCares had pre-positioned emergency medicines and supplies to help families displaced by the record-breaking storm. An emergency shipment is underway with enough medical aid for 20,000 survivors, including antibiotics, wound care supplies and pain relievers. AmeriCares is also providing emergency funding that will allow partner organizations in the Philippines to purchase and distribute critical relief supplies in the hardest-hit areas"
UNICEF staff in the Philippines are "rushing into position to deliver aid. More emergency experts are on the way. In Copenhagen, 60 metric tons of emergency supplies – for the health, medical and shelter needs of children – are being readied for an emergency airlift, to arrive within 48 hours." Doctors Without Borders is "strengthening its teams with an additional 30 people including medical personnel, logisticians and psychologists arriving in the coming days. MSF is also sending 200 tons of medical and relief items, which will arrive in Cebu within the next three days. A first cargo plane will leave from Dubai tomorrow, and a second will depart Belgium on Tuesday. The humanitarian cargo includes medical kits for treating wounded, material for medical consultations, tetanus vaccines, and relief items such as tents and hygiene kits." Catholic Relief Services will "prioritize emergency shelter, water and sanitation, household relief items (blankets, kitchen items, cookware), potable water, and toilets." World Vision: "For as little as $24 you can provide essential supplies like a blanket or mosquito net. Just $33 can supply clean water and hygiene kits for a family. A gift of $184 can give a family emergency shelter. $285 can provide the essentials that a family needs to survive, including food, clean water, shelter, education, and child-friendly spaces." MercyCorps: "Based on our initial conversations with the United Nations, we anticipate the most pressing needs to be clean water, sanitation, temporary shelter and food." 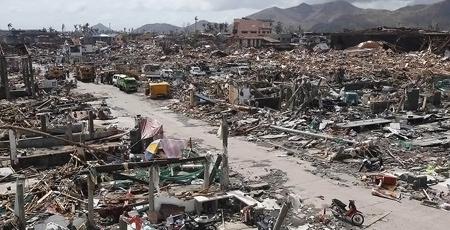 Save the Children has "already deployed a rapid response team to meet the needs of children in the city of Tacloban, where the super typhoon hit with deadly force. In Vietnam, Save the Children has an emergency response team ready to assist communities affected by the superstorm. It has warehouses in Hanoi and Da Nang stocked with 6,000 household, hygiene, and education kits ready for distribution."